Pepsi reported its latest results Thursday. And even though it acknowledged "challenges" in its US soda business, Pepsi posted solid sales growth in North America from Lipton and Pure Leaf, LifeWTR and Kevita kombucha and probiotic cleansing drinks. All that added up to a stellar quarter for Pepsi (PEP), which reported sales and profits that topped Wall Street's forecasts. The stock rose nearly 1% on the news. Pepsi's results come just two days after its top rival Coca-Cola (KO) also reported better-than-expected sales and profit, led by the fist increase in volume from the Diet Coke brand in North America in more than seven years. Coke recently rolled out four new Diet Coke flavors that it clearly was targeting to Millennials -- things like Ginger Lime and Feisty Cherry. So how will Pepsi respond to Coke's newfound Diet Coke success? Chief financial officer Hugh Johnston said in an interview with CNNMoney that Pepsi is also working on "some things with flavors" for the core Pepsi brands, which he described as a "work in progress." But Johnston said its "innovation strategy" -- working to develop more non-soda drinks -- is paying off too. He pointed to the launch of the company's new bubly brand of sparkling water, for example. The sparkling water category is red hot thanks to the success of the LaCroix brand that's owned by National Beverage (FIZZ). Coke is trying to gain a foothold in this market too. It recently bought the US rights to Mexico's Topo Chico band. Pepsi also recently unveiled Tropicana Coco Blends, pineapple and peach passion fruit drinks that also have coconut water. There's also a new line of organic Tropicana juices for kids that have no added sweeteners or artificial flavors. "Gatorade Zero is going to be a big winner," Johnston said. Pepsi also just rolled out Mtn Dew Ice, a clear lemon-lime flavor. Pepsi promoted it in a Super Bowl ad with Morgan Freeman and Missy Elliott that paired with a new ad for Doritos Blaze starring Peter Dinklage of "Game of Thrones" and Busta Rhymes. And Pepsi is doing so more online as well. Johnston said 30% of the company's ad spending is now on digital platforms. That percentage has gone up steadily over the past few years and should keep doing so. 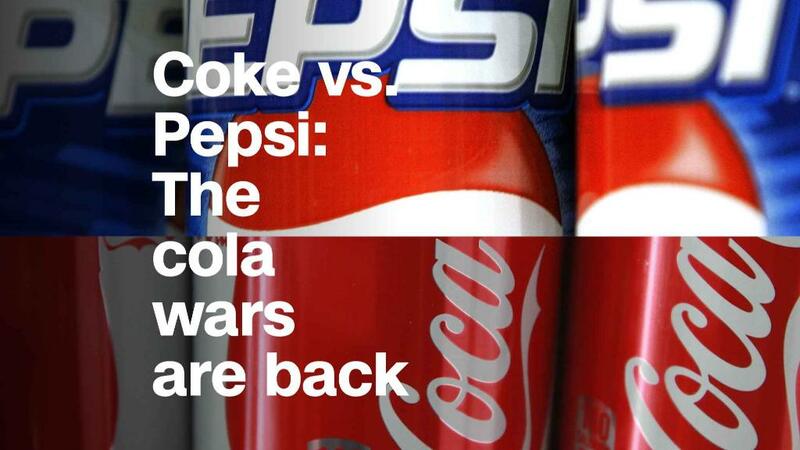 So the Coke vs. Pepsi war is definitely back on. But it's now playing out on Google, YouTube, Facebook and Instagram as well as TV.